GOOD MORNING my sweet friends & welcome to our 3rd day of our 5 Days of Christmas! Unfortunately, I have been w/o an internet connection!! :( So I am doing this post w/my IPad! 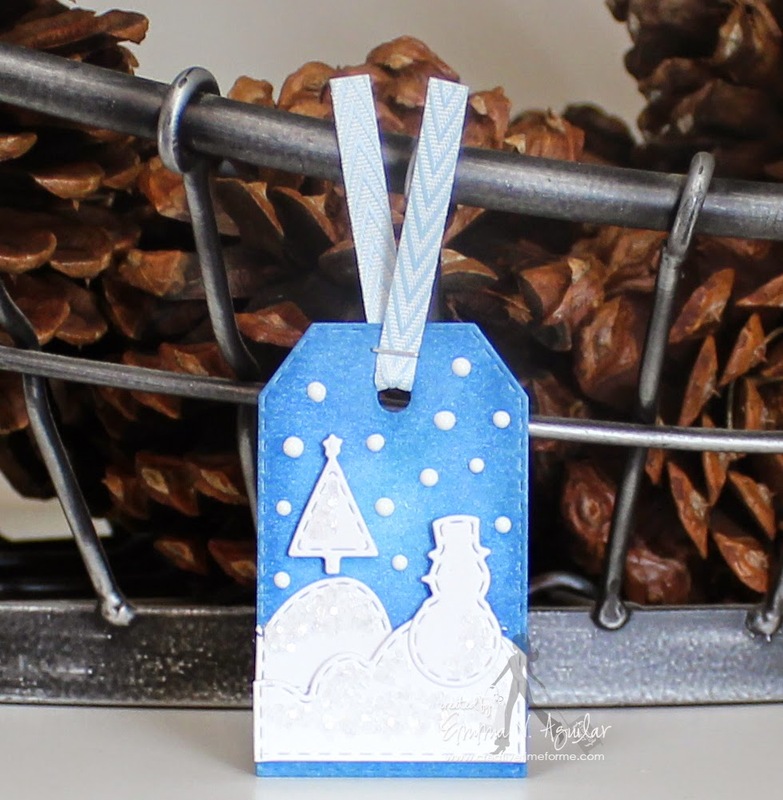 I do have a video showing EXACTLY how I created these tags from beginning to end! Apparently my internet service told me that we will be back up & running at 5am! (I HOPE!!) Please check back later this morning for my video! YAAAAH!! Here is my video for you today! Oh how adorable!!! I just love when a tag is simple ,easy and darling to boot!! but I'll be there to watch your video when it's up. I love your tags they are just as cute as can be! I love the silhouette look it's a fav of mine and the colors are so pretty.& just always am amazed with all of the clever and creative ways you come up with for using your goodies!! YOU so ROCK!! Here's to your internet back soon and hope your day is FAB & FUN!! Thanks too for a chance for your most awesome giveaway!!! Sorry about the Internet! I do love what you and your DT have created! Very cute tag! Hope your internet gets fixed soon! Awesome projects by the DT also! Emma, I love your tags. What a great idea to use your cloud die for the snowy bank! The blue is so pretty with the white. Enjoy your day! Hope your internet is back up soon. Such pretty tags! The white sillouettes are lovely against the blue background. Awwww, cute as can be. Isn't it amazing how life comes to a stand still when we lose our modern technology. I'll look forward to seeing the video later and getting the complete scoop on how you put this darling tag together. Meanwhile, it's like a little guessing game and I can see how close I come to figuring it out in my head then compare it to the actual directions. Super cute tags Emma!!!! Boo to internet problems...so annoying!!! Adorable little tags! So clever of you to use the clouds for snow!!! Yiks! No internet! That's not in my vocabulary in this day and age! I do hope you can get back on line in a short time! Your little tag is adorable! I am kicking myself for not picking up this snowman set and die! I know better then to talk myself out of things, but budget comes first! Love all the DT projects so far! Looking forwards to what you bring us tomorrow! Brilliant! I Always love how all the sets work together! Wow,his adorable! Thanks for sharing. Will check back later to see video of cute tag. Great tag ideas. DT did an awesome job with their projects too. Have a great day. I am LOVING those gorgeous tags Emma!!!!! Super adorable idea!!!!!! Oh Emma ~ these tags are GORGEOUS! I LOVE the white against the blue with all the PERFECT details!! Okay while your at it make me a bunch too! LOL! As for the giveaway today ~ EEEEEEKKKKKK!!! I need these too! Wow ~ you really have the BEST giveaways right now!! Again this team ~ AMAZING as always!!! As for the internet ~ where is the dislike button??? I'm impressed you were able to use your I Pad to post ~ that would never happen here ~ technology challenged! LOL! Emma, these tags are stunning! Love the colors! Absolutely beautiful! Beautiful tags Emma! I love the blue and white and of course I love the snowman!! Amazing how dependent on technology we have become! Look forward to your video. I'm making some tags today!! So pretty Emma. I hope your loss of internet didn't get in the way of the boys homework and that you are up and running soon. My On Demand wasn't working this morning...must be the weather. As iwrite this blog I have the snowman die ready to go. have a great day. Everyone's project today are just adorable. Thanks for another great day! Oh my goodness such sweet adorable tags! Awesome projects once again from the whole team and what a fabulous prize pack... woot woot... thanks for the chance! The tags are so pretty. There is a great scene on them. the stitched dies really add interest to the cuts. Love your beautiful tags. I really love blog hops, such awesome way to get some inspiration!! I feel for you not having internet. We were w/o internet for five days last month. I was going to McDs every day with my tablet. Off to see the awesome DT creations. Thanks for the TH prize chance--the minis have been on my wishlist. Love the tag and how you could do several for gifts....thanks for the chance to win the FANTASTIC pack!!!!!!!!! I love cute, simple, quick projects and your tag is a winner! I love how you did the snow at the bottom with the cloud die-cuts and glitter. Your giveaway package is most generous filled with many essentials! Happy Holidays. 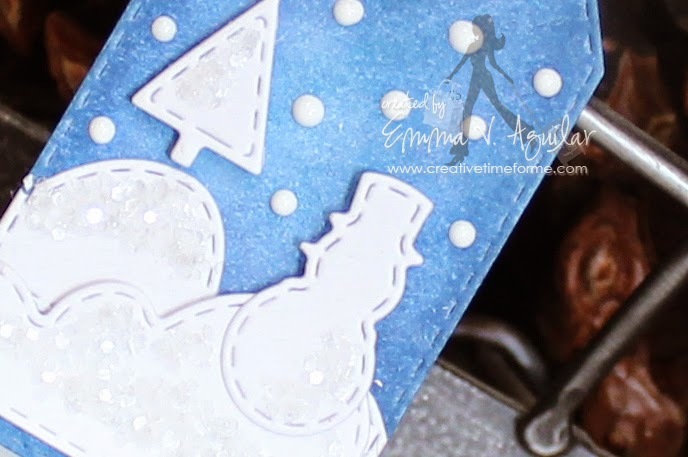 Very clever to use the clouds for your snow...sweet job on a pretty tag scene. I love how everything fits perfectly on the little tag. So many fun project ideas today...and all week...super super job everyone! I am thankful there is a My Creative Time Blog, products and designers to be so inspirational. Your giveaways are fabulous and so generous. Love your sweet blue and white tags. I am loving the blue and white for Christmas. Awesome work, DT! Super Duper cute tag!! I love it Miss Emma! Your video was great as always! Loving your tags and what I especially love is how your products all fit together. You know Emma with me working full time, the hours are long and sometimes I just don't want to use my Silhouette or Expression to paper piece. I get such great quality projects by using your dies. LOVE THEM! Thank you so much for all you do in the crafting world. Your tags are GORGEOUS! Thanks for sharing. I so agree with you about the round Mini Ink blending foams. I LOVE how well they work. I have one tucked into the bottom of each of my Mini Distress pad and Memento Dew Drop bases. So So many cute tags an snowmen!!!! These tags are super duper cute! I never have enough tags. I have a pretty good start on my tags for the first time this year, but you can never have enough. Thanks for inspiring! Another great day of Christmas ideas. Emma, your tags are adorable!! Love, love, love your tag!!! LOVE your tags!! So simple yet adorable!! Edna Alberty O My Goodness!!! Thank You for sharing your talent. Emma, I just love your tag! I watched the video and I can't wait to try and make some of these. Thank you for always inspiring! Dt Gals, you are so awesome always the best!! Emma, super cute tags! Just saw them on the YouTube video and just had to come on to hop along to see what the DT has done. You and all of your DT have done a great job. Just visited the DT's blogs and they all have some awesome tutorials. . TFS. Love these tags. This is an awesome give away. Love what everyone has done so far. Awesome tags! I love how dimentional they look! Thanks for the inspiration! 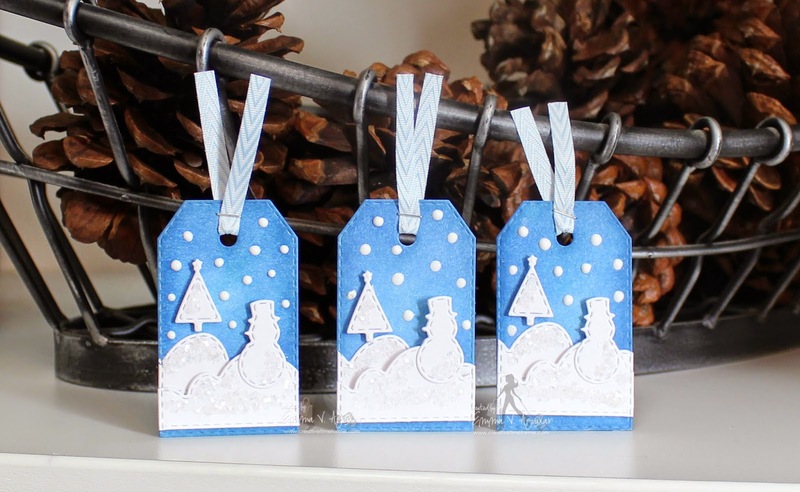 Beautiful winter tag set. Awesome DT projects too again. Awesome week here. Super cute tags! Great giveaway! Very cute tag Emma!! Would have never thought to use the cloud die as snow banks...great idea! Fabulous giveaway also!!! Super cute tags! Thanks for sharing your ideas! Your tag is adorable!!! I love all the white against that blue!! Hugs!! What cute tags! Thanks for the chance to win. Chiming in to add my voice to the others: these tags are abundantly awesome! Crisp, fresh and oh-so-festive! Your tags are just adorbs! Glad you got your internet back, I'm sure it's terribly frustrating. Soooooo cute!!! Love the idea!! !